In the build-up to QuakeCon 2017, which starts tomorrow, Bethesda has announced launch dates for their three major VR titles for the holiday season. 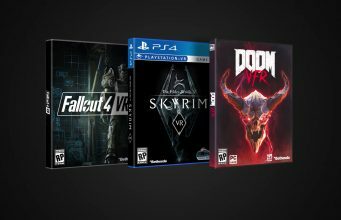 Skyrim VR (PSVR) launches first on November 17th, followed by Doom VFR (PSVR, Vive) on December 1st, and finally Fallout 4 VR (Vive) on December 12th, rounding out what promises to be a very merry VR holiday. Skyrim VR remains a PSVR-only title for now, but is likely to find its way to PC. Bethesda continue to refer to the PC versions of Doom VFR and Fallout 4 VR as ‘Vive’ games, but they are both likely to be playable with Oculus hardware, whether pseudo-officially via OpenVR’s support for the Rift, or with an unofficial workaround to unlock any purposefully imposed barriers, as we’ve seen with other SteamVR games which attempted to block Rift functionality. The legendary annual QuakeCon is held in Dallas, Texas hosted by parent company ZeniMax Media is home to publisher Bethesda Softworks’ world-famous IP, with this year’s focus on the Quake World Championships esport competition. Attendees can also get hands-on time with a number of upcoming Bethesda-published games in the Exhibit Hall, including all three VR games, plus Quake Champions, The Evil Within 2, Wolfenstein II: The New Colossus and Dishonored: Death of the Outsider. The hall will be open from Thursday to Saturday 10am–6pm daily. For further information on QuakeCon 2017, visit the official site. The post Release Dates & Platforms for ‘Skyrim VR’, ‘Doom VFR’, and ‘Fallout 4 VR’ Revealed appeared first on Road to VR.